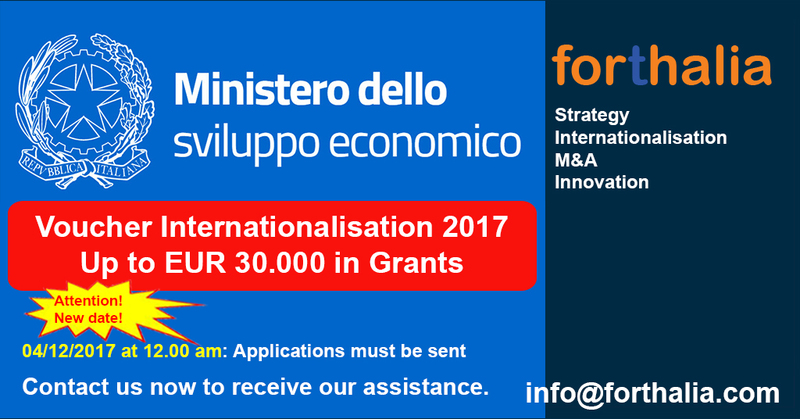 The Italian Ministry of Economic Development - MISE (Ministero dello Sviluppo Economico) has allocated a contribution to incentivate companies to approach Export and Internationalisation. Forthalia is one of the official supplier companies for Internationalisation and Temporary Export Manager services in the 2017 initiative. Forthalia, who, in addition to the 2017 initiative was also qualified in the same earlier initiative of 2015, is the ideal partner to carry out Internationalisation activities. If you are interested, do not hesitate to contact us via our web contact form.